Dr. Dustin P. Dinh graduated from the University of Texas at Austin in 1999 with a Bachelor of Science degree in Chemistry, Biochemistry, and Zoology and a minor in Spanish. He worked as a quality assurance chemist for two years prior to returning to graduate school to study dentistry. In 2005, he earned his Doctorate in Dentistry from the University of Tennessee in Memphis, TN. Dr. Dustin Dinh furthered his education by studying Orthodontics at the University of Tennessee and spending a year in General Practice Residency at the Veteran Affairs Hospital where he helped to restore the oral health of many of our nation’s health-compromised veterans. 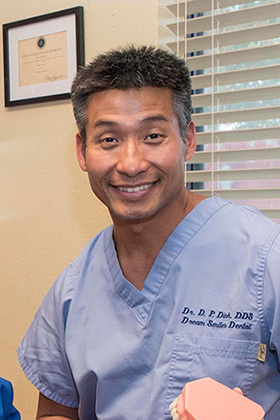 Dr. Dinh is a member of the American Dental Association, the Texas Capital Dental Society, the International Association for Orthodontics, and the International Congress of Oral Implantologists as well as a member of the Georgetown Chamber of Commerce. Dr. Dustin Dinh was born in Vinh Long, Vietnam. At the age of eight, he and his family immigrated to the United States and settled in the Houston area. Dr. Dinh attended school in the Klein ISD and discovered his passion for learning while developing a love for Texas. Although Dr. Dinh left Texas for a few years, his heart remained in Texas and his dream of returning to the Austin area came true when he acquired a general dentistry practice in Georgetown in 2007. Dr. Dustin Dinh’s personal hobbies and interests include cycling, sand volleyball, running, snowboarding, cooking, gardening, ballroom dancing, and volunteering.